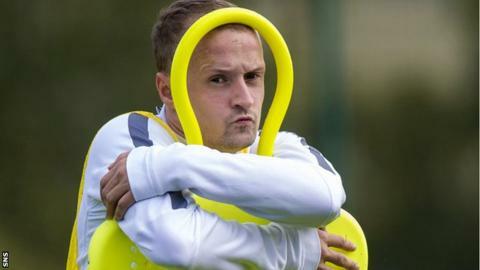 Celtic manager Ronny Deila has confirmed continuing interest from Hibernian in taking striker Leigh Griffiths on emergency loan. But he insisted that nothing had been settled as yet and that the Scotland international remains in his plans. "We haven't agreed on anything," said Deila. "But we will see what happens. We will see how it goes." Griffiths had a successful loan spell with hometown club Hibs while with Wolverhampton Wanderers. However, the Edinburgh club have since been relegated to the Scottish Championship, where they are struggling in seventh position following last season's relegation. Griffiths, who began his career with Livingston before joining Dundee, has scored once in seven appearances. BBC Scotland revealed Hibs' interest in the 24-year-old last month after he scored his first goal of the season in a 1-1 draw with Dundee. Deila insisted then that he had no interest in allowing any of his players to leave, but Griffiths has not featured in Celtic's next three fixtures.